Giving a cat a pill isn't the easiest thing to do, but there's definitely a technique for delivering the medication. There are also a few alternative delivery methods you can try if dealing with all those teeth and claws feels just a bit too intimidating. Read these directions a couple times before you attempt to give your cat her medication. That way you can just focus on her when you give her the pill. Place the cat on a solid surface, like a counter or tabletop, with a nonslip area rug beneath her. She'll feel more secure if she has solid footing, and she may struggle less. Have your helper hold her in place so she can't back up or dart away. The key is not to hold the cat too tightly because that alone may make her feel a need to escape. Hold the pill in your fingers on one hand, and use your other hand to pull up top jaw. Almost simultaneously, pull down on the lower jaw and pop the pill into the back of the cat's throat as far back as you can place it. Quickly close the cat's mouth, but keep one hand under her chin in case she spits the pill back out. With your other hand, stroke her throat gently to encourage her to swallow. Alternatively, you can try blowing gently at her nostrils, and this may also persuade her to swallow. If she does manage to spit out her medication, you'll need to repeat the entire procedure. 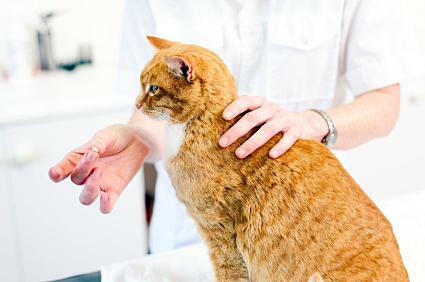 Although you may be able to give your cat a pill by yourself, you might want to ask someone to help. This should be someone your cat knows and feels comfortable with. Giving the pill may sound more complicated than it is. As you'll see in the following video, the entire procedure is very quick. The veterinarians at Olathe Animal Hospital in Kansas have a little difficulty with their first attempt, but they're able to give the cat her pill on the second try. Some cats absolutely refuse to swallow pill, so you may have to find an alternative way to deliver the medication. Try one of the following methods. If the pill is a tablet, you can crush it and stir it into a spoonful of your pet's favorite wet cat food. You can also mix the crushed pill with a spoonful of chicken broth or fish oil, and then pour the liquid into the cat's mouth. Keep her chin up and blow at her nose to encourage her to swallow. If the pill is in capsule form, try hiding it in a pill pocket. Pill pockets are flavored, and some cats will swallow the medication easier if they like the taste. If you want to leave the pill whole, try using a pill gun to help administer the medication. The pill gun works similar to a syringe, except it doesn't have a needle on the end. The gun helps you place the pill further back in the cat's mouth while keeping your fingers clear of her teeth. The medication won't do your pet any good unless she swallows it, so you want to make sure she receives the entire dose. This is easier when she just swallows the pill, but you have to be more careful if you're hiding the medication in food. Make sure you only use about one bite's worth of food to conceal the pill so she's more likely to eat it, and watch her closely to make sure she doesn't spit the pill out while she chews. If she swallows and there's no sign of the pill anymore, you've successfully administered her medication and can rest easy until the next dose is due.